Dachau, September 29, 2010 - Thorlabs has extended its line of M² analysis devices for automated M² measurements by adding two new extension sets for use with our CCD Camera Beam Profilers (BC106-UV for measurements in the 190 - 350 nm range and BC106-VIS for use in the 350 - 1100 nm range). Now, customers have the option to either use a scanning slit profiler or a camera beam profiler together with the appropriate extension set for their M² analysis measurements. 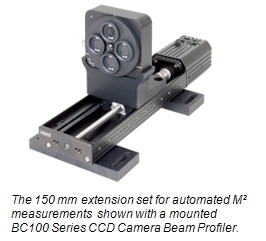 The new BC1M2 series sets are available with either a 150 mm or a 300 mm translation stage. In just a few steps, a fully automated system can be built consisting of the profiler itself, the extension set, and optomechanical components for beam alignment. The system allows M² and beam divergence measurements of CW or pulsed sources according to the ISO 11146 standard in less than a minute and with better than 5% accuracy. According to the ISO 11146 standard, at least ten beam profile measurements shall be analyzed at several discrete positions, centered around the beam waist position; approximately half of these measurements must be taken within one Rayleighlength around the beam waist, and the remainder need to be taken at positions exceeding one Rayleigh-length in order to fully characterize the quality of a laser beam. All relevant beam parameters are calculated from these measurements via curve fit. In addition to the common beam quality parameters, beam waist position, beam waist diameter, beam divergence, and Rayleigh length are calculated. The M² analysis is completely controlled by a software module, which is part of the standard software package shipped with each beam profiler. It calculates the above-mentioned parameters from the measured profiles and offers a positioning utility for the precise alignment of the system’s motorized stage and laser beam. The BC1M2 series extension sets include the translation stage, a profiler mounting adapter, and an RS232 cable with USB-to-RS232 adapter, as well as the power supply for the stage. For more flexibility in adapting to the customer’s application, the optomechanical components­ for beam alignment are not included and must be ordered separately.